This is an overview of what a Space Marine can do according to the ‘Philverse’ explanations of 40K technology. The aim is to provide a framework that re-enforces the heroic image of the 40K Space Marine. As 40K matures and pushes more and more into new media like computer games and movies, it seems the capabilities of the Marine changes to match the new medium. I know the Black Library’s position is to take 40K and make it ‘real’, and therefore bring 40K to life, and that approach yields very different Marine compared to the table top game. The same holds true for computer games like Dawn of War. None of these various media versions of Marines seem very compatible with each other, and often each new expansion seems to drift towards Marine mediocrity. This can lead to Marines being portrayed in a way that does not seem to match what they are. Often they seem to acting like trigger happy ‘mooks’ or ‘cannon fodder’, and end up being killed off in droves. This popular image jars with supposed tactical prowess, robustness, and fire-power of the Angels of Death. It makes even less sense when we consider their rarity, and the difficulty of the conversion process of man into marine. Either they are the ‘elite of the elite’ (and should act like it) or they are not (and should not be purported as such). It would be nice to have an overview of what a Marine can actually do, and how they act. To define their abilities and character in a ’40K cheat sheet’. This could help to avoid the Marines ending up in roles that make little sense for a Marine – often nothing more than new clothes to wrap up the same old mooks. The Red Suns are a new addition to my DIY Chapters. They are based on Japanese culture and mythology. 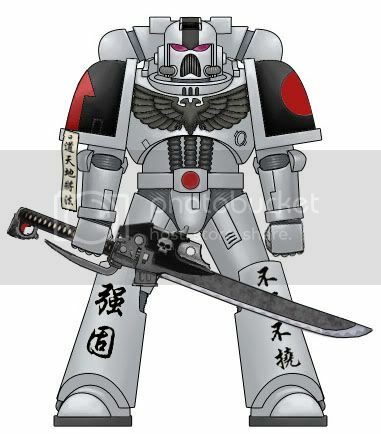 In essence they are ‘Samurai in Space’ in the same way Eldar are ‘Elves in Space’, so there will be a fair bit of twisting of preconceived ideas.